Waterman has christened its most contemporary writing instrument "Carene" which literally means "hull of the ship". Every flowing line celebrates the shipbuilder's art. Fountain pens with a fine or medium 18k gold inlaid nib contoured into the streamlined barrel. Rollerballs and ballpoints with a bold clip curved like a billowing wave. Included in many finishes already available is the NEW Blue Obsession lacquer. Refill with fountain pen cartridges and the included converter. Rollerballs and ballpoints hold refills from Waterman. Carene, a worthy vessel of self-expression. Waterman ballpoint pens are a one-piece twist to deploy design. The Waterman ballpoint pen will accept a broad selection of ballpoint refill technologies: standard ballpoint ink, GEL ballpoint ink, and liquid ink ballpoint ink. Some of these ink choices come in as many as ten colors or offer broad, medium and fine points. Waterman fountain pens are available in their historic Carene collections, as well as their Expert, Perspective and Radiance models. All Waterman Carene fountain pens are sold in fine and medium nibs. Other Waterman fountain pen models offer a medium nib point. Waterman fountain pens feature both steel and gold nibs, depending on the model. 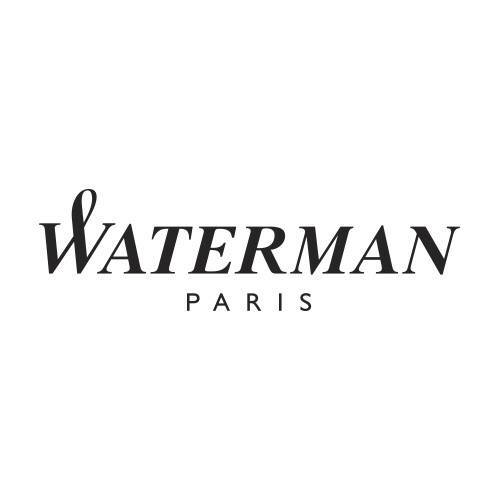 All Waterman fountain pens will accept Waterman ink cartridges or can be used with a converter and bottled ink. All Waterman rollerball pens feature a separate cap and body design. Your Waterman rollerball pen will fit a Waterman rollerball, fiber tip or special Waterman standard ballpoint refill, enabling your Waterman rollerball pen to instantly become a ballpoint. We also offer Monteverde rollerball refills, spring-loaded fineliners, standard fineliners, liquid ink and GEL ink refills. Certain Schmidt and Pelikan rollerball refills fit too. Some refills come in as many as ten color choices and fine or medium points.